This is a chart I found this evening on one of my favorite blogs, www.zerohedge.com. With SAT reading scores at an all time low, it’s a great time to focus on creative and alternative methods to help teach vocabulary. A broad base of vocabulary helps with all aspects of the verbal section of standardized tests, including analogies, sentence completion and reading comprehension. The downward trend shown on the chart makes “Cook Your Way Through The S.A.T.” pretty timely (and it’s lots of fun). We hope you consider including the book in your test prep resources. This entry was posted in Mom's View, Vocabulary. Bookmark the permalink. At 53, I can’t wait to get your book so I can test both my culinary and vocabulary skills. 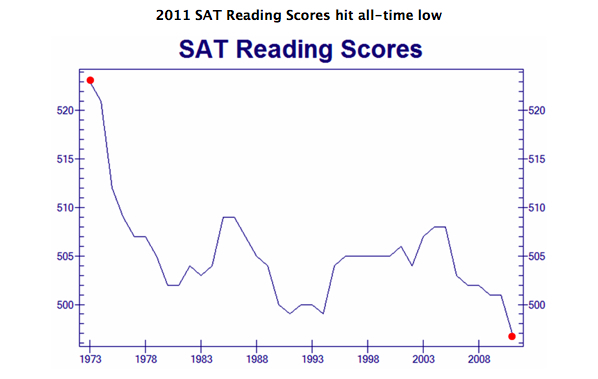 As of today, you would no doubt score higher on the SAT than a seasoned adult.